Many financial advisors have a love/hate relationship with marketing; they love the idea of marketing, but hate actually doing it. Often that's because advisors don't know where to start when it comes to marketing their firm. 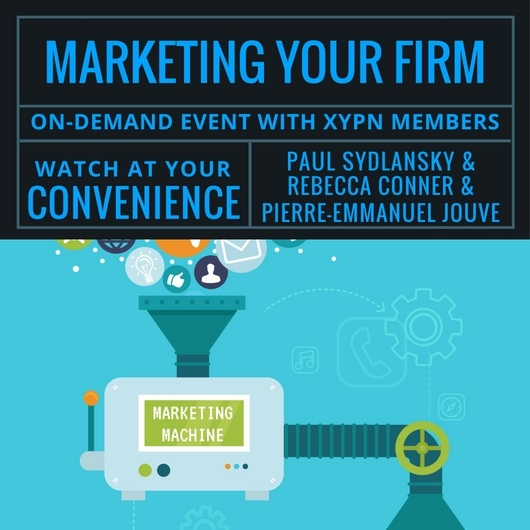 Hear how these 3 XYPN Members have incorporated marketing into their firms, where their time and money has been best spent, and what steps they took to get started. How much time each week do you spend on marketing? What are the top marketing activities new firms must do? Is outsourcing marketing worth the cost? Pierre-E. Jouve is a CERTIFIED FINANCIAL PLANNER and the Founder of InsuraWealth, a Financial Planning and Investment Services company, focused on supporting Generation X & Y, Young Families, New Parents and Business Owners. As a husband, father and business owner himself, Pierre understands the ever changing financial environment/climate in which we live, and the ever changing priorities and concerns of young families. When working with Pierre-E. Jouve, you will always receive an honest, trustworthy and knowledgeable partner to help you and your family prepare for what life throws your way. Paul Sydlansky, CFP® founded Lake Road Advisors to take the confusion and anxiety out of financial planning. He earned a BA in Economics from Marist College before launching his career on Wall Street. Paul also earned an MBA from New York University. After the aggressive Wall Street lifestyle lost its appeal, Paul moved his family to upstate New York for a better quality of life. "I wanted to be successful in my career, but I was not willing to sacrifice my family life,” he said. 'I knew that there was a more effective and efficient way to help people navigate the confusing financial landscape." Originally from Dallas, Texas, Rebecca became the youngest real estate agent in the state on her 18th birthday. After college, she became a CPA and joined the public accounting industry doing taxes, she then moved into industry and worked for Dimensional Fund Advisors for 4 years as their tax expert. After getting married, she and her husband moved to Seattle, WA where he works for Amazon and she obtained her CFP while working at a local wealth management firm. Then, after baby was born she decided to take the plunge and hasn't looked back. Two years into her business, she is bringing on an average of 6 clients a month and finding the balance between automation, delegation, and personal relationships with her clients. Schedule an introductory 30-minute Call with XYPN's "Growing the Movement" Team to get started on Membership!